Betta, or Siamese fighting fish are freshwater creatures so the water in a home aquarium must be replaced on a regular basis with clean water to prevent the salinity from rising. The water temperatures in the aquarium should be maintained at 25-30°C. Water pH and carbonate harness KH needs to be maintained at 6.0-8.0 and 1.0-2.0 respectively. You cannot keep more than one male betta in the same tank. Betta fish need a lot of maintenance, even though they can breath surface air on their own using their labyrinth. Poor maintenance may increase the toxicity level of the water and make it uninhabitable. Bettas grow to an average length of 7 centimeters, the fins included. 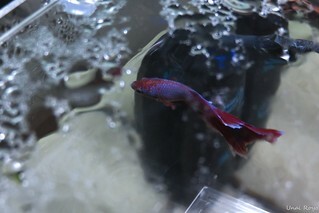 They have large, brightly colored flowing fins. However, wild bettas have a dull green color while others are grayish. This is largely due to selective breeding of domesticated bettas. Bettas are largely carnivores. However, they can still eat vegetable matter. For a balanced diet, feed your fish with betta fish pellets, fish flakes, live bloodworms, brine shrimp and frozen dried foods among other types of foods. Be sure to feed them on a daily basis. Male bettas are usually responsible for building bubble nests. When interested in a female, the males usually twist their bodies, flare their grills and spread their fins. In response, the females usually curve their bodies back and forth, and darken their color. During spawning, the female can release 10 to 40 eggs each time. Fertilization takes place externally as the male releases milt into the water. Incubation takes two to three days, after which fish larvae are produced. They usually spend up to three days in the nest before they can start swimming freely in the water. Sexual maturity is attained after four months. In addition to physical injury, there are many diseases that can affect your bettas. They include fin rot, popeye, gill hyperplasia, constipation and parasite irritation among others. Be sure to replace the water regularly to deal with some of these problems. Also have an appropriate fish antibiotic and anti-parasitic medium around the house at all times. This entry was posted in Freshwater Fish, Freshwater Tropical.